April is a wonderful month to be in Amsterdam and the Netherlands as a whole. The Dutch come out in droves as the sunny days return, and as dusk falls later and later, there's even more time to explore. Amsterdam's event calendar is full this month, as multi-colored rows of tulips blanket the fields at the famed Keukenhof Gardens and locals await King's Day, a wild celebration in honor of the king's birthday. April weather in Amsterdam can be unpredictable. The Dutch like to say, "April doet wat hij wil," which means April will do whatever it wishes to do. Luckily, temperatures are generally beginning to warm up, which means you can enjoy all of the charms of the city without winter's bitter cold. A bit of rain is almost guaranteed during your April trip, but not too much: This is still one of Amsterdam's driest months, with just 1.4 inches of rain spread across 12 days. Days are also getting longer during April; you can expect to see around 10 hours of sunlight per day—a large improvement from February when the city receives just five hours of sunlight each day. Even though April is considered springtime, it's still a bit chilly and temperatures can drop significantly after dark. Amsterdam is a walking city, which means that packing clothes that are both warm and functional is a must. Many of the streets are cobblestoned, so leave the high heels at home! Amsterdammers love spring and it shows: April's event calendar is full of historical holidays, celebrations of art and culture, and even a festival for beer lovers. Kleinkunst Festival: The long-running event takes over two Leidseplein theaters with talent from the world of Dutch cabaret. These performances are in Dutch only, but are still plenty entertaining. Breakin' Walls Festival: Frascati Theater puts on this "international, multi-disciplinary youth festival" each year, showing off the performance talent of adults under 27 years old. Easter: The holiday is popular in Amsterdam, but unlike many cities, most shops, restaurants, and museums stay open to visitors. Meibockfestival: A must-attend for beer lovers. Come on over to the Posthoornkerk to sample the season's best beers for very affordable prices. National Museum Week: Museums all over the Netherlands ditch their (often pricey) admission fees for the week, held in mid-April. See the National Museum Week website for a complete list of participants by city. King's Day: Around 1 million revelers will descend on Amsterdam for the holiday formerly known as Queen's Day, which is celebrated on April 27. Those who'd prefer to avoid the crowds should head to open spaces like the Vondelpark, which turns into a children's paradise on April 27. Amsterdam Tulip Festival: This celebration runs all month long—or as long as the tulips are in bloom. This colorful celebration showcases these flowers across the city, from Noord to Zuidoost and Oost to Nieuw-West. World Press Photo: This event honors the best photojournalism each year with an awards ceremony and mobile exhibition, which debuts in Amsterdam's Oude Kerk (Old Church) before it travels the world. 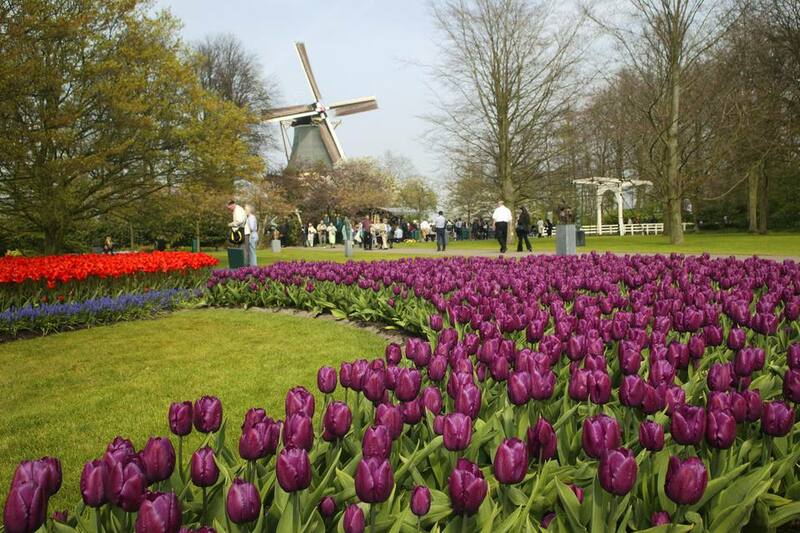 Keukenhof, the Netherlands' world-famous bulb flower park, is at its best in late April. As the gardens can be quite crowded, it's best to visit in the early morning or late afternoon. Airfare and accommodation fees rise thanks to "tulipmania" and Queen's Day festivities. Tourist attractions also become more crowded throughout April. If you want to celebrate King's Day (along with everyone else in the city), be sure to don your best orange attire. The festivities are free throughout Amsterdam.